Triple LED headlights with stylish daytime running lights and bold spindle grille, draw attention to the LX’s sharply designed front fascia. A stylish focal point of the instrument panel, the elegant GPS analog clock’s self-illuminating dial ensures excellent legibility. A beautifully ornamented genuine leather shift knob, designed to fit snugly into the hand, is just another example of Lexus’s dedication to the details. The Remote Touch Interface is your virtual road map to total control. Featuring a touch surface area and utilising mouse or joystick-like gestures, it offers easy access to multimedia, climate control, directions, and more. Select performance to match your driving style with six drive modes: NORMAL, ECO, COMFORT, SPORT S, SPORT S+ and CUSTOMIZE. 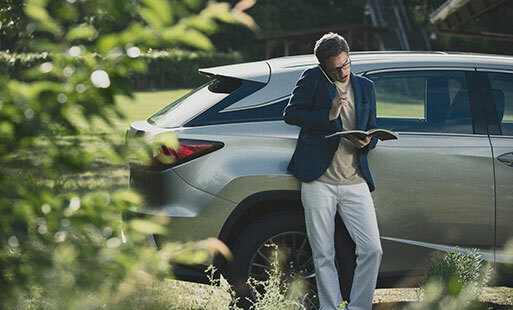 AVS continually adjusts shock-absorber damping rates while driving, delivering the type of buttery-smooth ride expected of a Lexus. When you drift into another lane without a turn signal, the LDA system alerts you with a buzzer and on the multi-information display. Moonroof not available. The All-speed Dynamic Radar Cruise Control reduces fatigue from highway driving and traffic jams by actively helping you to maintain a safe distance from the vehicle ahead. The parking assist monitor accurately guides your parallel and reverse parking attempts by displaying projected parking lines superimposed on the back camera’s video feed.